Throughout the year students celebrate the various occasions within the classroom, be it with crafts or food or even singing songs. To many newcomers, the idea of a magical bunny that gives chocolates to children is even crazier than Santa Claus! Our morning class at SOICS spent the two classes leading up to Easter learning about Canadian Easter traditions. 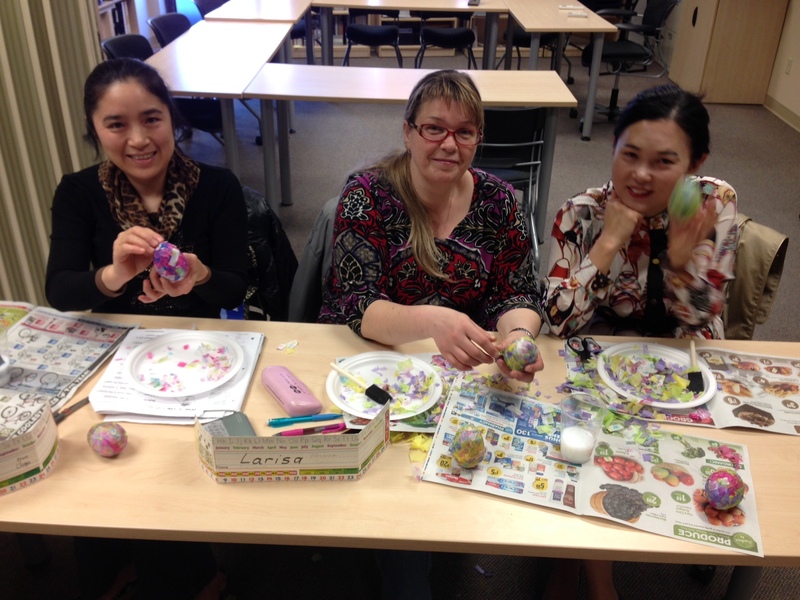 The class prepared for the Easter long weekend by making and decorating papier-mâché Easter eggs to give as gifts. Each egg contained chocolates and candies, and its recipient had to crack it open to find them. During the months of September and October, LINC classes followed the Federal election through news coverage and talking to one of the local candidates. The lesson plans included videos, websites, and handouts from Elections Canada to understand the basic concepts of how the Canadian Political System works. Students were introduced to all of the five major parties and their platform. For new Canadians, it was vital for them to understand how to vote for the candidate of their choice in their riding (also called an electoral district or constituency), which in turn contributes towards a political party’s chances of forming a government. We requested Elections Canada to come to our offices and register new Canadian clients. During their visits, they shared information about registration and voting with both existing voters and new ones. There was also a mock election held in the classroom to increase understanding of voting steps. Hence students were exposed to the voting process and its importance. These events not only gave the students the knowledge and background they need to feel comfortable enough to vote on their own in this election or in the future, but was also beneficial to any students who are studying to pass their citizenship test. 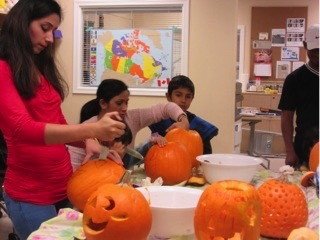 All three LINC classes in Penticton got together for an afternoon of Halloween fun! If you didn’t show up in costume, our LINC teachers dressed you up themselves in silly glasses, spooky wigs and fun hats. 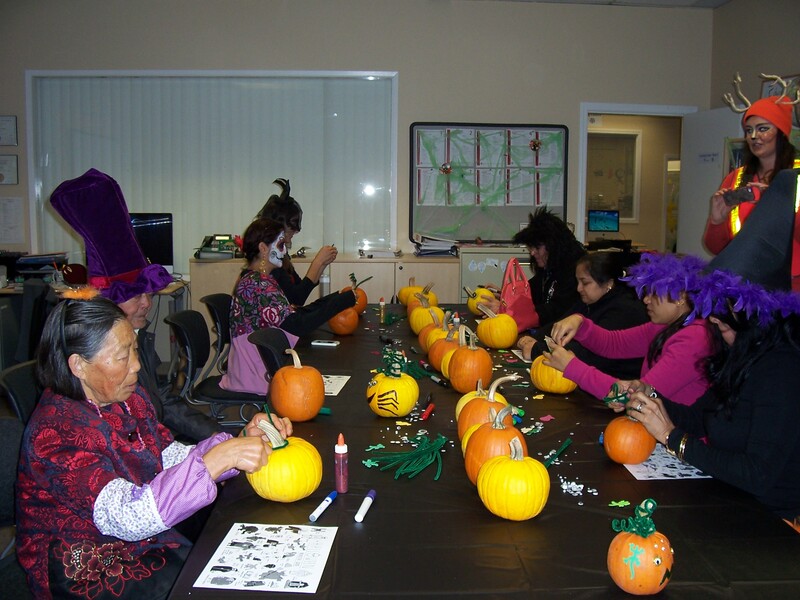 Everyone decorated a pumpkin to take home and display at their house. We learned a line dance to The Adams Family theme song, and people got into teams and made students into toilet paper mummies! We all had a wonderful time and of course, ate lots of candy; Halloween isn’t just for kids! 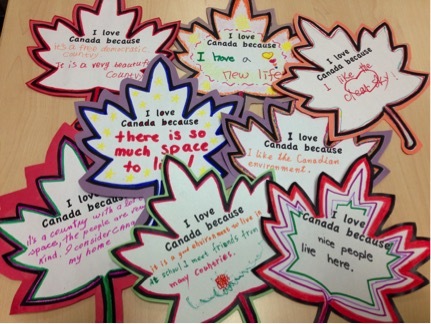 As part of our early celebration of Canada Day at the end of the school year, each student in the Beginner LINC class decorated a maple leaf and wrote out in simple English all the reasons they love Canada. We were delighted with the results; it is always refreshing to see Canada through many different lenses. Once a month, the LINC students in Oliver enjoy a movie and popcorn night. It’s an opportunity for everyone to relax and have fun together, but watching movies is also a tried and true tool for learning English. Language teachers have been using movies in their classes for decades and have seen students benefit. Movies are an excellent source of authentic language and give examples of how language is used in the world beyond the classroom. Many LINC students have said that they have learned most of their slang and ‘real’ English from watching movies and TV shows. The accompaniment of the spoken word with images also makes it easier for many learners to understand and for them to get that instant connection with the language. On our movie nights we choose films about the students’ cultures or with a Canadian connection. Recently, we’ve watched Beeba Boys and Bend it with Beckham, both of which are set in Indian families. The students enjoy sharing the glimpses into their cultures offered by movies with each other. Sitting down and watching a movie together has helped the group connect socially as well and has helped them to go from being classmates to becoming friends. 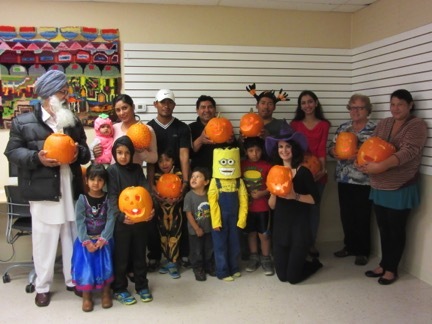 The Oliver LINC class ended October with a spooktacular Halloween party! The students and their kids carved the pumpkins that they picked on their field trip to the farm, did bobbing for donuts and had a wrapping competition to see who could make their daddy into the best mummy. (See the photo to find out what that was all about)! Everyone had a blast as they got to know each other better and practiced their conversation skills. Thanks to Rachael for her creative game ideas! Teaching and learning can become inherently spontaneous and student-centered when moved from the confines of the classroom into the local community at large. Taking advantage of the office location, throughout the year, LINC students go on a scavenger hunt in the downtown Penticton area. This activity also provides for a variety of assignments that enable the instructor to fit different student needs. At times, it is conducted so that all questions are discussed on one day or students can address one question each week. 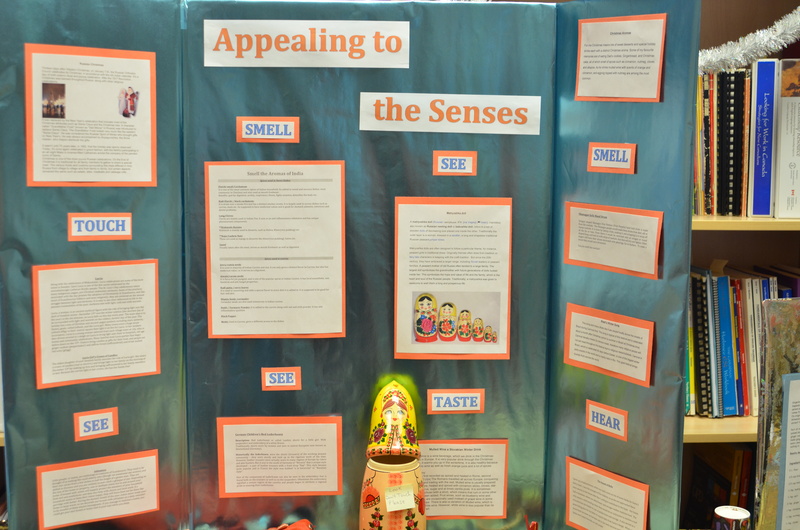 Whether it is a St. Patrick’s Day theme or focused on vocabulary gain, this activity gets students out into the community. They are encouraged to explore new stores, parks and art galleries. The LINC instructor carefully selects places they might never go to if not for being in the supported environment of LINC class. During the hunt, clients have to interact and talk with clerks and strangers in order to accomplish their tasks. They are putting all their English skills that they have learned in class to use in the real world and are challenging themselves to step out of their comfort zone. An additional goal of the scavenger hunt is to improve students’ familiarity with finding and using a variety of resources. As an active-learning activity, the scavenger hunt goes beyond teacher instruction to give students the opportunity to practice and develop their searching skills on their own. Students enjoy the fun atmosphere and explore Penticton with a smile on their face and silly memories to keep for later. The idea of a holiday dedicated to giving thanks is an abstract one for some ESL learners. Leading up to the long weekend, LINC classes took the time to learn about Canadian Thanksgiving and to think about everything we have to be thankful for. 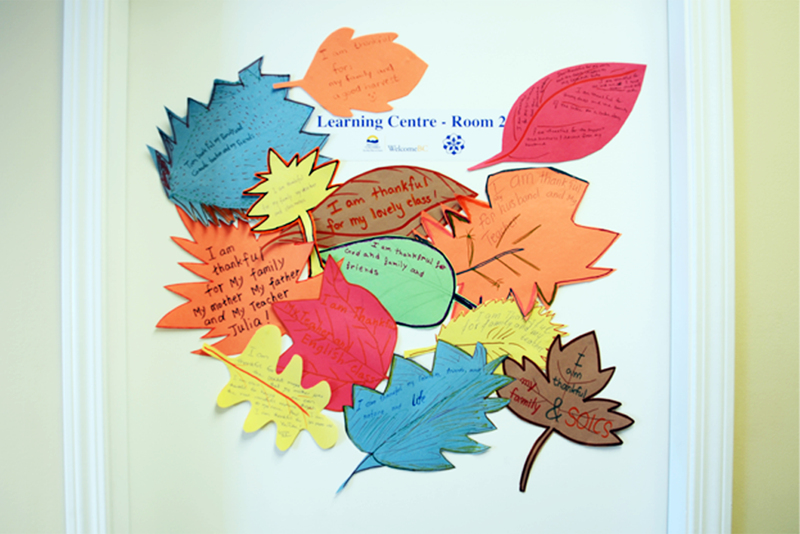 To decorate for Thanksgiving, students in the Penticton LINC classes, along with SOICS staff, made paper leaves decorated with their own words of gratitude and posted them on our classroom doors. We couldn’t be happier with this beautiful daily reminder to be thankful for all that we have, right here in our office hallway because gratitude is the best attitude. The centerpiece of the gathering was our tree decorated with holiday wishes. Each guest and staff member was asked to write a wish for the holidays and the coming year on a decoration, and then find a spot for it on the tree. Midway through the party the tree was already glittering with dozens of thoughtful wishes, big and small. We are sure to make this an annual tradition. 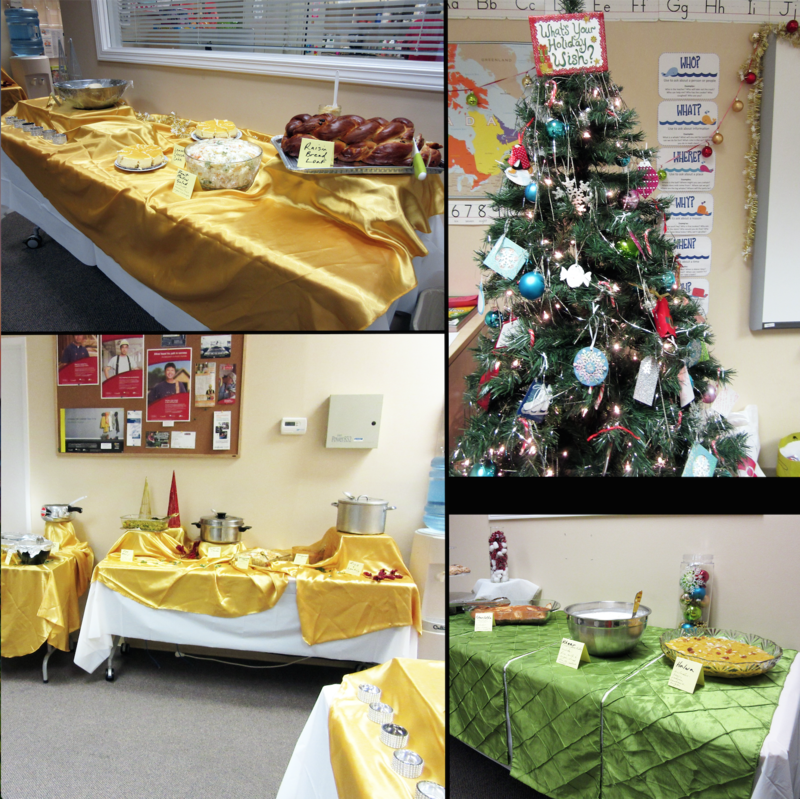 SOICS team created a multicultural display to showcase their favourite winter traditions from their own families. We all worked together to bring in things to listen to, read, look at, touch, and smell to make a holiday sensory display. Because our team comes from such diverse backgrounds, the display showed a beautiful array of traditions that our guests could experience. As a bonus, we got to learn more about what the holiday means to them.